If I ask myself (or if someone else would ask me) what Berlin cuisine is like to me, I would consider it to be open-minded and manifold in the first place. I couldn’t imagine Berlin without that gorgeous mixture of Currywurst and Apple strudel, Banh Mi and Burgers, Felafel and Spätzle, Matze and Soljanka. Historic Old Berlin inn’s treats however are not on my list. But maybe it’s worth to take a closer look, not the least because the traditional Berlin cookery is a cuisine that reflects diversity as much as contemporary food habits do. It was mainly shaped during industrialization when people from everywhere came into the city to stay and brought their favorite treats with them, often from Eastern and Central Europe, and also from surrounding Brandenburg. A staple of Berlin cuisine – both now and then – are little snacks for consumption in between. At the turn of the century, most inn’s presented those snacks in so called Hungertürme which translates to hunger towers. Those have been glass cabinets with simple home-made treats to fill the stomach quickly and at a low budget. 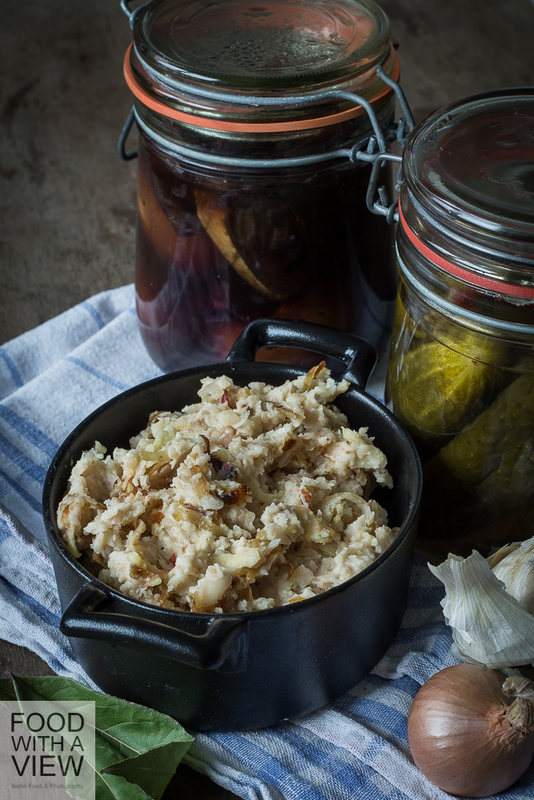 It often contained pickled cucumbers from Spreewald, pickled eggs, and slices of bread spread with spicy lard that has often been substituted by much cheaper bean spread. I’ve tried to prepare the three of them in a modern way: with coriander-spiced bean spread, eggs with an oriental twist and cucumbers which come in a hot version with chili and garlic. It’s a match – and it continues the culinary Berlin tradition of bringing along and varying things according to your own taste that we can identify with so well. Cucumbers can be pickled raw in tubs (they will develop liquid on their own), or preserved them in jars – that’s what I learned on many different Spreewald websites. I chose preservation and tried to find an own way for the stock’s measurements. Fortunately, it worked. This treat is vegan and gluten-free. Put the cleaned jars and rubber bands into softly boiling water for 5 minutes and let air-dry on a clean kitchen-towel. In the meantime, boil up all ingredients for the stock for 5 minutes until salt and sugar are melted. Leave to cool down. 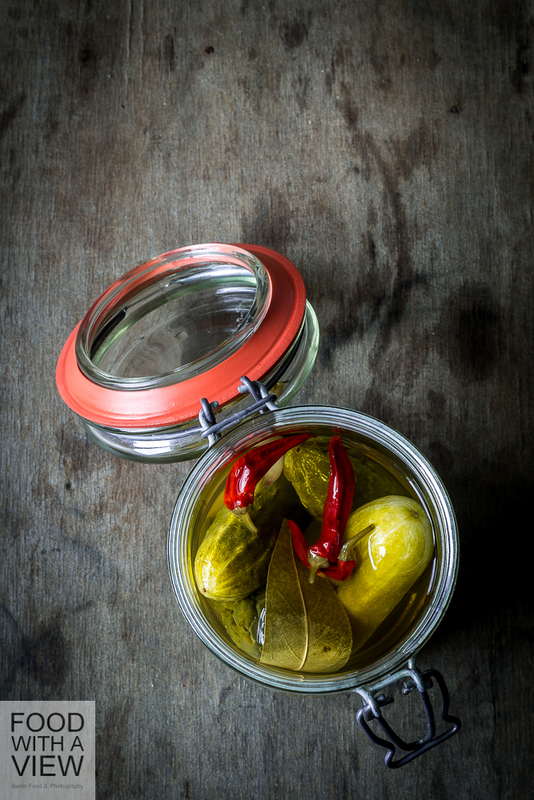 Carefully clean and dry the cucumbers and put them into the jars together with the stock’s solids. Completely cover with the stock and carefully close the jars. With a boil-proof kitchen towel, cover the bottom of a pot wide and tall enough for both jars (they shall not touch each other or the sides of the pot). Put the jars on the towel and fill in water of the same temperature as the stock until the filling height reaches 2/3rd of the jars. Carefully heat up the water, and once it’s boiling, cook for 15 minutes. Take the jars off the pot and put on a cork pad or a wooden board. Leave to cool and store in a dark and cool place for at least one week. 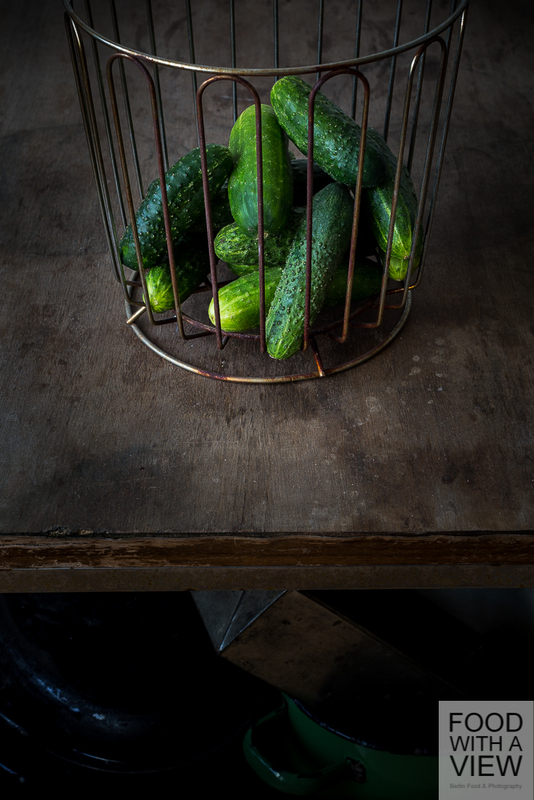 Once opened, the cucumbers are consumable for quite a while, provided that you keep them in the fridge with the cucumbers completely covered with stock all the time (mine are in their 3rd week now and they get ever tastier). 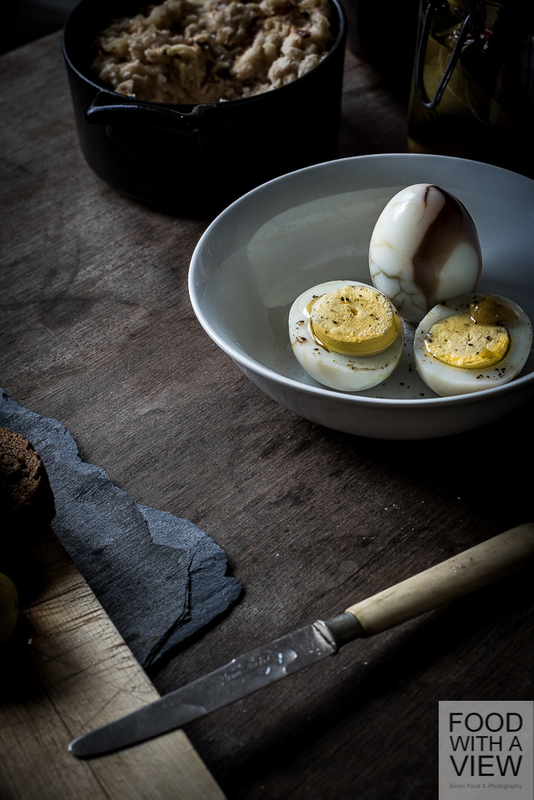 Originally, pickled eggs have been cooked in heavily salted water (which is sole – indeed the German name of pickled eggs translates to sole eggs), then the egg-shell have been cracked and the sole was poured over the eggs for preservation. After a couples of day, they were properly infused and ready to eat. Later, someone invented to add onion peels to get a nicely colored mosaic along the cracks of the shells. 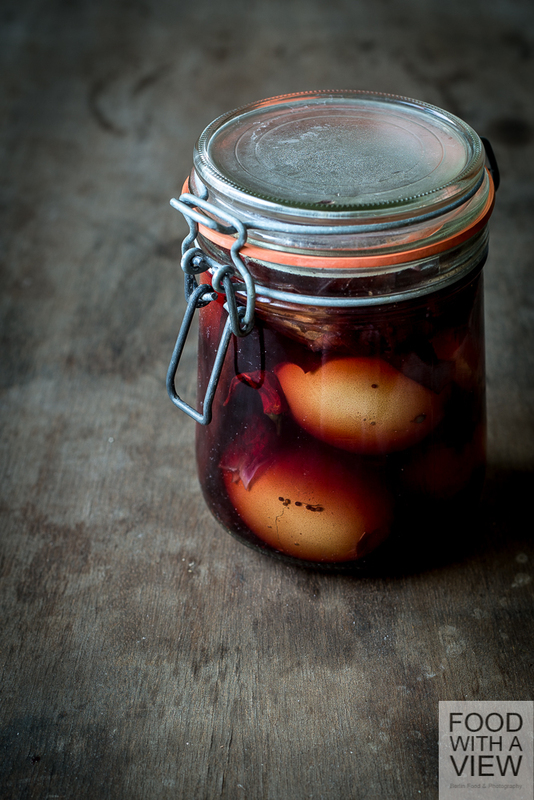 Today, most recipes recommend to pickle the eggs only after peeling them, and it’s no longer mere sole that is used for it but a spicy stock. However, I stick with aunty Trudel, a friend of my Hessian grandmother. She was originally from Berlin where she had a nice upper class living with tennis lessons and sports cars – she was definitely not dining at inn’s, I suppose, nevertheless she knew and loved pickled eggs. Her descriptions of big jars with lots of onion peels in a dark broth with some eggs mystically shining through and uncovering their beauty only after peeling had quite an impact on me as a child already, so I can’t help but following this anachronistic, yet enchanted way. Regarding measurements of salt and water, I asked Wikipedia for advice, and when it came to vinegar, I tried as long as it took to get it right. This treat is gluten-free unless you use a gluten-free sort of mustard. Put a cleaned jar and rubber band into softly boiling water for 5 minutes and let air-dry on a clean kitchen-towel. Cook eggs for eight minutes (if you cook longer, you risk to get green rims around the egg-yolks). Drain and rinse with cold water to refresh. Slightly cook all other ingredients for 5 minutes and let cool down the stock to room temperature. Crack the egg shells all around each egg and layer them into the jar together with the solids of the stock, then pour the stock in until all eggs are covered. Close the lid and put into the fridge. 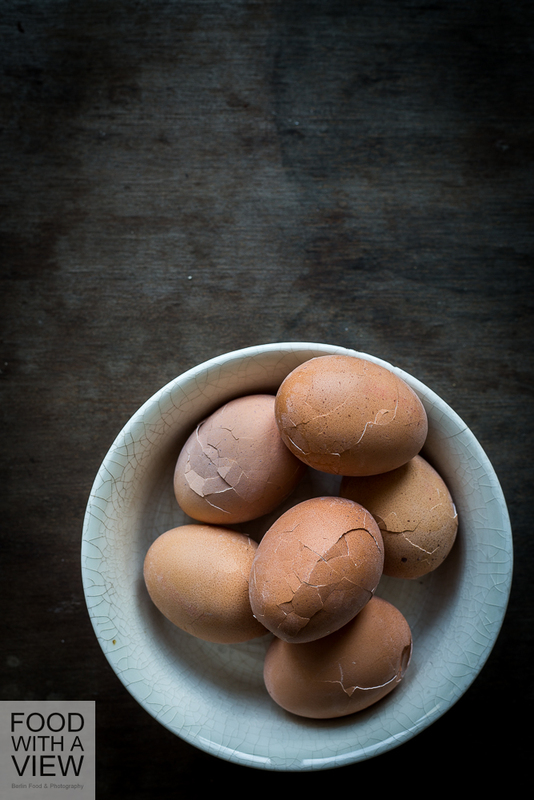 Let infuse for at least one day – both the pattern on the eggs and the flavor will only be subtle then. I liked it best on day three with very noticeable flavors of cinnamon and ginger. 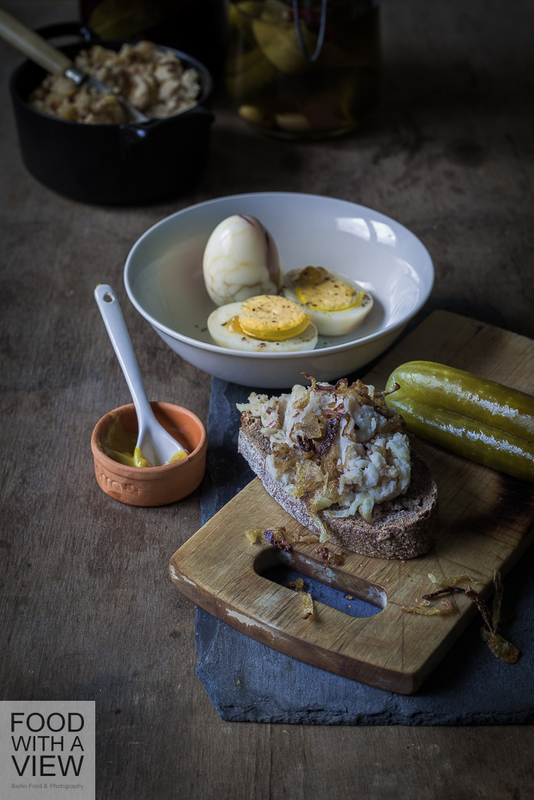 In Berlin, pickled eggs are traditionally eaten this way: cut an egg into halves, take off the egg yolks, add some mustard to the egg white, carefully put in again the egg yolks, season with oil, vinegar, salt and pepper. I followed this tradition with just a little turmeric twist in the mustard – it matches the other flavors quite well. The German word for this recipe is literally „bean-lard“. I guess that sounds funny in English, doesn’t it. 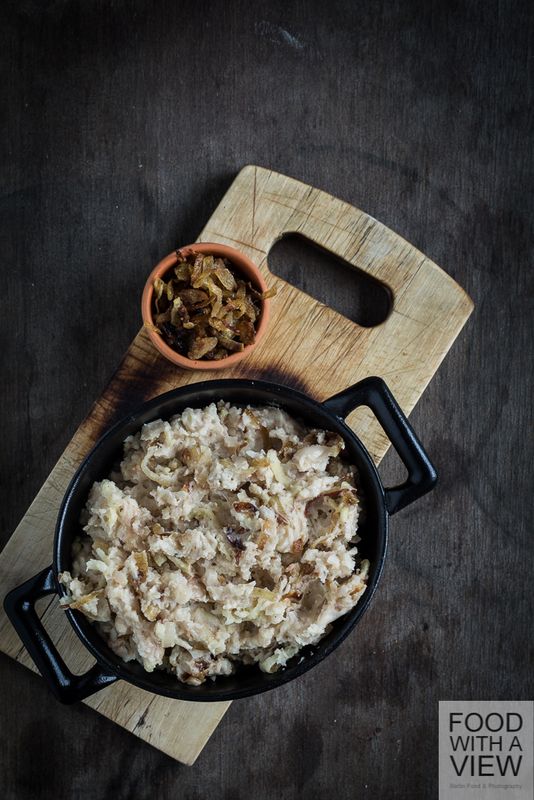 Apart from linguistics, it’s a spread that consists of mashed white beans, roasted onions, oil, and grated apple. In Berlin – like elsewhere – it had been a cheap substitute for real lard and is rediscovered as a fine treat today. Taste and consistency a similar to the kind of spiced lard that is used as a sandwich spread in rural cuisines all across Germany. I came across a recipe for this in my early years as a student and I have prepared it ever since. High time to have a post with it! This treat is vegan, however not gluten-free. Soak the beans in water for 12 hours, drain and rinse, then cook with fresh water, bay leave and garlic for about one hour until soft. In the meantime, fry the onions in oil until they get golden, salt and pepper to taste. Add the flower and stir until everything is emulated. Spread the onions on a baking plate covered with baking paper and put into the preheated oven (150 °C). Low temperature (and longer cooking time) would be perfect, but that’s impossible with my oven. Roast the onions for 5 minutes, then turn over all onions and roast again for 5 minutes. Now go on like this every minute, three times, until the onions are nicely brown-colored and crisp. Drain the beans and leave to cool down, take off the bay leave. Take the little skins off the beans by slightly pressing them, then mash the beans with a potato masher and fold in as much oil until the consistency is chunky-creamy and not too soft. Season generously with salt, pepper and coriander. 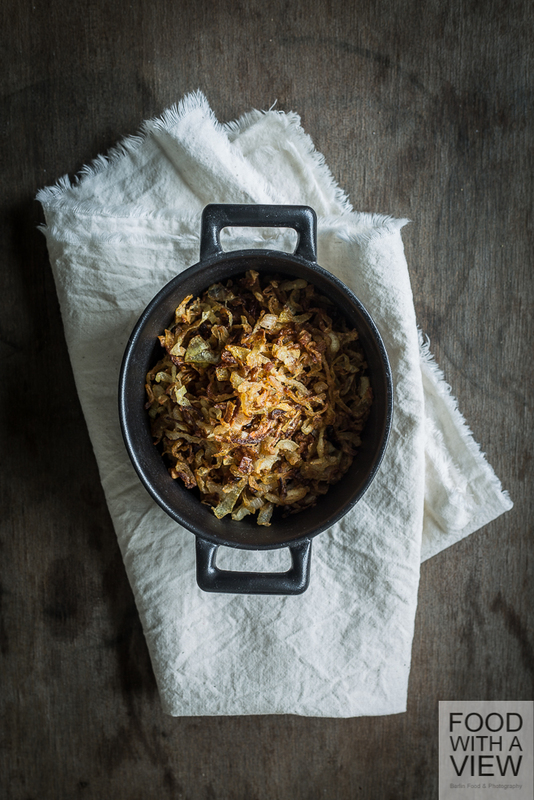 Coarsely grate the apple and fold into the bean mash, as well as the onion (leave some aside for decoration). The bean spread can be served immediately but it’s even better after a few hours of resting. Since the apple is fresh and not cooked, the spread is consumable for just about three days. 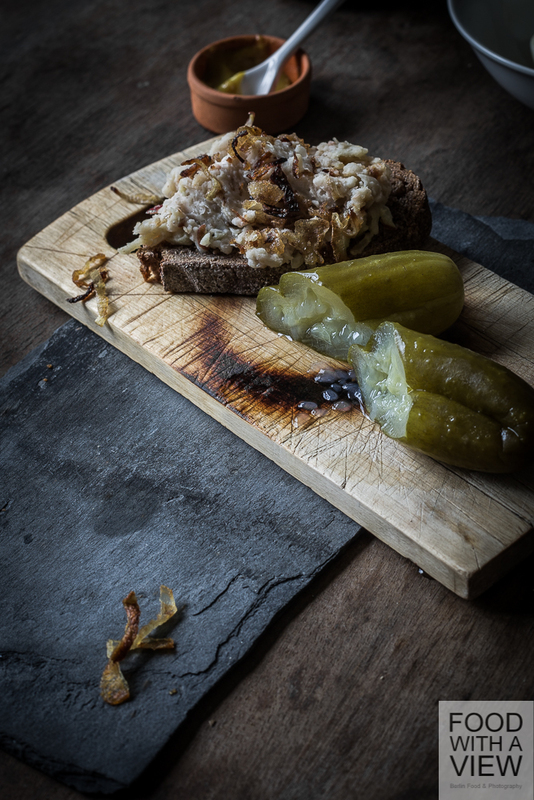 Generously spread the bean paste on some slices of rustic wholegrain bread and sprinkle with the remaining onions. Of course, you can enjoy these treats each for itself or have them with other dishes. But the combination of the three of them is really nice – and I hope you had some fun on this little journey. Wenn man mich fragen würde, wie sie in meinen Augen denn aussehe, die Berliner Küche, dann würde ich antworten: nach allen Seiten offen und vielfältig. Ich könnte mir diese Stadt kulinarisch gesehen nicht vorstellen ohne die wunderbare Mischung aus Currywurst und Apfelstrudel, Banh Mi und Burgern (sogar vegetarisch), Falafel und Spätzle, Matze und Soljanka. Das Angebot Alt-Berliner Lokale hingegen steht eher nicht auf meiner Liste. Aber es lohnt sich, mal genauer hinzuschauen – nicht zuletzt, weil die traditionelle Berliner Küche Vielfalt und Zuwanderung genauso reflektiert wie die gegenwärtige. Geprägt wurde sie vor allem während der Industrialisierung, als Menschen von überall her in die Stadt strömten und ihre Lieblingsgerichte mitbrachten, vor allem aus Ost- und Mitteleuropa und aus dem Brandenburger Umland. Ein Gassenhauer der Berliner Küche – damals wie heute – ist der kleine Imbiss, der gern aus mehreren Komponenten bestehen kann. Um die Jahrhundertwende herum wurden diese im sogenannten Hungerturm präsentiert, der auf jedem Kneipen-Tresen stand. Darin zu finden waren kleine Sattmacher für wenig Geld, und oft fanden sich darunter Schmalzbrote (oft ersatzweise bestrichen mit dem günstigeren Bohnenschmalz), Soleier (angeblich eine Berliner Erfindung) und natürlich Gewürzgurken. Zusammen ergeben sie eine schöne kleine Brotzeit, die ich mit vor allem orientalischen Gewürzen ein bisschen variiert habe. Das steht den dreien gut und setzt die Berliner Tradition des Mitbringens und Anverwandelns fort, mit der wir uns so gut identifizieren können. Wie ich auf diversen Spreewald-Seiten gelesen habe, kann man Gewürzgurken roh und ohne Flüssigkeit in Fässern einlegen und Saft ziehen lassen oder sie im Sud einkochen. Ich habe mich für letzteres entschieden, weil ich mit dem Einkochen überhaupt so etwas ähnliches wie Erfahrung habe und bei mir leider zudem kein Einlegebottich herumsteht. Die Mengenverhältnisse der Marinade habe ich nach Gefühl ausprobiert, glücklicherweise hat das geklappt. Das Rezept ist vegan und glutenfrei. Die gewaschenen Gläser und Gummringe 5 Minuten in kochendes Wasser tauchen und auf einem sauberen Handtuch lufttrocknen lassen. In der Zwischenzeit die Zutaten für den Sud einmal aufkochen, 5 Minuten köcheln und dann abkühlen lassen – Salz und Zucker sollten danach aufgelöst sein. Die Gurken gründlich waschen und trocknen. In die Gläser schichten und vollständig mit dem Sud begießen, die festen Bestandteile auf die Gläser verteilen und diese fest verschließen. Auf den Boden eines genügend weiten und hohen Topfes ein kochfestes, zusammengefaltetes Handtuch legen, auf dem die Gläser stehen können ohne zu klötern. Beide Gläser in den Topf stellen und mit lauwarmem Wasser aufgießen, bis das Wasser 2/3 der Höhe der Gläser erreicht hat. Topfdeckel auflegen, vorsichtig erhitzen bis es mittelstark sprudelt und dann 15 Minuten köcheln lassen. Nun die Gläser aus dem Topf nehmen und auf eine Holz- oder Korkunterlage stellen, sonst springen die Gläser möglicherweise. Vollständig auskühlen lassen und kühl und dunkel gelagert mindestens eine Woche ziehen lassen. Sofern die Gurken nach dem Öffnen im Kühlschrank stehen und von Flüssigkeit bedeckt bleiben, halten sie sich auch dann noch eine gute Weile (inzwischen bin ich bei Woche drei, und sie werden immer leckerer). Soleier wurden ursprünglich einfach nur in starker Sole gekocht, ihre Pelle wurde angeschlagen und die Sole abgekühlt über die Eier gegossen. Nach ein paar Tagen waren sie durchgezogen. Später kam jemand auf die Idee, mit Zwiebelschalen färbend nachzuhelfen – das Ergebnis war hübsch marmoriert wegen der angeschlagenen Eischalen. Heute findet man vor allem Rezepte, bei denen die Eier erst gepellt werden und dann eingelegt, und zwar in einen würzigen Süd. Zwei tolle Beispiele dafür haben kürzlich Sabine von Bonjour Alsace und Julia von Chestnut & Sage gepostet. Ich halte es heute mal mit Tante Trudel, einer Freundin meiner hessischen Großmutter: Sie kam ursprünglich aus Berlin und hatte dort in Kreisen mit Tennis-Stunden und Sportwagen verkehrt, war also definitiv keine Eckkneipen-Gängerin. Soleier kannte und liebte sie dennoch, und die hohen Gläser mit Zwiebelschalen-Sole und Eiern, die ihre Schönheit erst nach dem Pellen offenbaren, hatte sie mir als Kind so eindrücklich beschrieben, dass ich nicht anders kann, als dieser vielleicht nicht mehr ganz zeitgemäßen, aber herrlich verwunschenen Variante zu folgen. Beim Mengenverhältnis Wasser zu Salz habe ich mich an Wikipedia orientiert, und beim Essig habe ich so lange probiert, bis es nicht zu säuerlich, aber deutlich frisch schmeckte. das Rezept ist glutenfrei, sofern ein glutenfreier Senf verwendet wird. Das gewaschene Glas und Ring 5 Minuten in kochendes Wasser tauchen und auf einem sauberen Handtuch lufttrocknen lassen. Die Eier 8 Minuten kochen (alles darüber ergibt den berühmten grünen Rand am Eigelb), abgießen und abschrecken. Alle anderen Zutaten zusammen aufkochen, 5 Minuten köcheln lassen und zimmerwarm abkühlen lassen. Die Eierschalen rundum anstoßen und die Eier abwechselnd mit den festen Bestandteilen aus dem Sud in das Glas schichten. Den Sud darüber gießen – die oben schwimmenden Eier sollten möglichst bedeckt sein. Mindestens einen Tag ziehen lassen, dann sind Marmorierung und Aroma dezent, perfekt ist es für meine Begriffe ab Tag drei. Traditionell isst man Soleier so: Ei pellen und längs halbieren, Eigelb-Hälften herausnehmen, etwas Senf in die Mulde geben, Eigelbe wieder einsetzen, Essig, Öl, Salz und Pfeffer oben drüber. Oder alles unten drunter, bis auf Pfeffer und Salz. Und ch habe untraditionellerweise dem Senf etwas Kurkuma zugefügt. Fett-Bemme de luxe ohne Cholesterin und mit viel Geschmack – eine prima Begleitung zu den Gurken und Eiern. Ich habe ein Rezept für Bohnenschmalz weiland als Studentin irgendwo aufgegabelt, und seitdem begleitet es mich und verändert sich immer mal wieder ein bisschen in der Rezeptur. Längst Zeit also, es endlich mal hier zu posten. Das Rezept ist vegan, jedoch nicht glutenfrei. Die Bohnen 12 Stunden einweichen, abgießen und durchspülen, mit reichlich frischem Wasser, Lorbeer und Knoblauch aufkochen und eine Stunde garköcheln. Währenddessen Zwiebeln mit wenig Salz und Pfeffer in Öl bei mittlerer Hitze anbraten. Wenn sie anfangen Farbe zu nehmen, das Mehl zufügen und sanft weiter braten, bis Mehl und Zwiebeln sich gut verbunden haben. Auf einem mit Backpapier ausgelegten Backblech verteilen und in die unterste Schiene des vorgeheizten Ofens (150 °C) schieben. Ideal wäre eine Temperatur unter 100 °C (und dann eine längere Garzeit), aber da ist mein Ofen vor. 5 Minuten rösten lassen, dann wenden, weiter 5 Minuten rösten. Nun im Minutentakt weitermachen (ca. dreimal) mit dem Wenden und Rösten, bis die Zwiebeln gut gebräunt und knusprig sind. Bohnen abgießen, Lorbeerblatt herausfischen, abtropfen und abkühlen lassen und Kerne aus den Häuten drücken. Bohnenkerne mit dem Knoblauchgut zerstampfen und so viel Öl unterschlagen, dass eine nicht zu cremige Konsistenz entsteht. Kräftig mit Salz, Pfeffer und Koriander abschmecken, dann den halben Apfel grob reiben und ebenso wie die Zwiebeln unterheben. Ein paar Zwiebeln als Deko beiseite stellen. Das Schmalz kann sofort verwendet werden, noch besser schmeckt es, wenn es ein paar Stunden durchzieht. Durch den frischen Apfel ist es allerdings nicht sehr lange haltbar, ca. drei Tage. 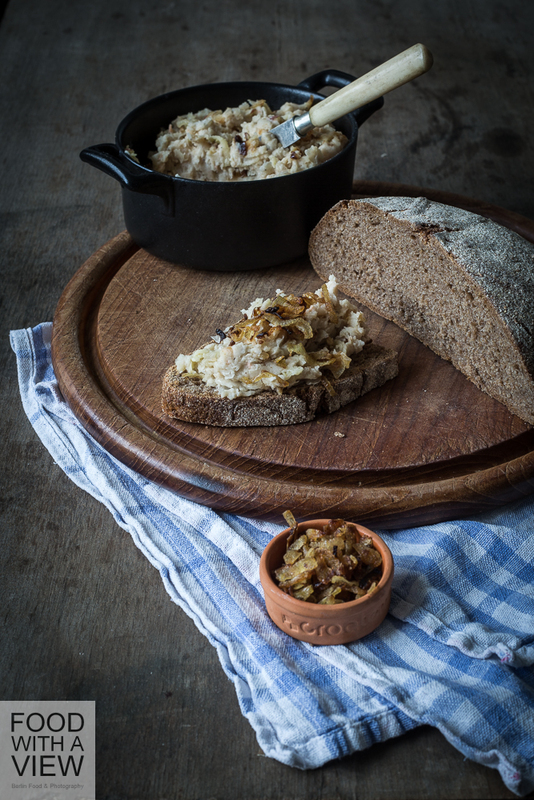 Brotscheiben dicke mit dem Schmalz bestreichen, mit zusätzlichen Röstzwiebeln bestreuen. Natürlich kann man diese drei Leckerein einzeln zubereiten und essen oder sie mit ganz anderen Dingen kombinieren. Zusammen sind sie aber ganz köstlich – und ich hoffe, dass der kleine Ausflug Euch ein bisschen Spaß gemacht hat. Ganz vielen Dank, liebe Julia! Ich freue mich, dass Dir die Fotos gefallen – mich hat das Grün der Gurken auch sehr beeindruckt. Diese Einlegegurken sind ja viel intensiver in der Farbe als Salatgurken, besonders wenn sie ganz frisch geerntet wurden (obwohl es auch eine weißlich-hellgrüne streifige Sorte gibt, wie die sich geschmacklich unterscheidet, weiß ich allerdings nicht). Lovely stories and recipes, Claudia. 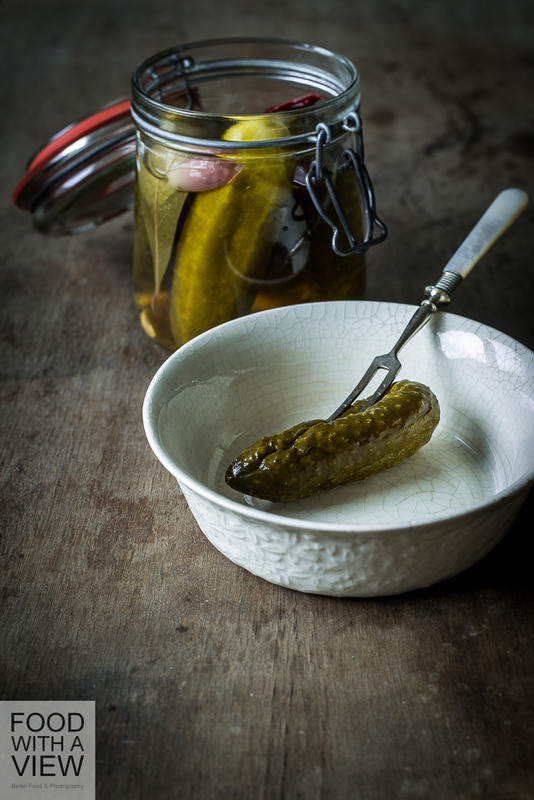 I make my own pickled cucumbers using my mom’s Russian recipe, and it is radically different from yours! Are the cucumbers still crunchy once you open the jar? They sound (and look) so appealing. Thanks for the hint to your recipe – I quickly searched on your blog and found the molossol cornichons – is it the recipe you meant? Sounds wonderful, too. 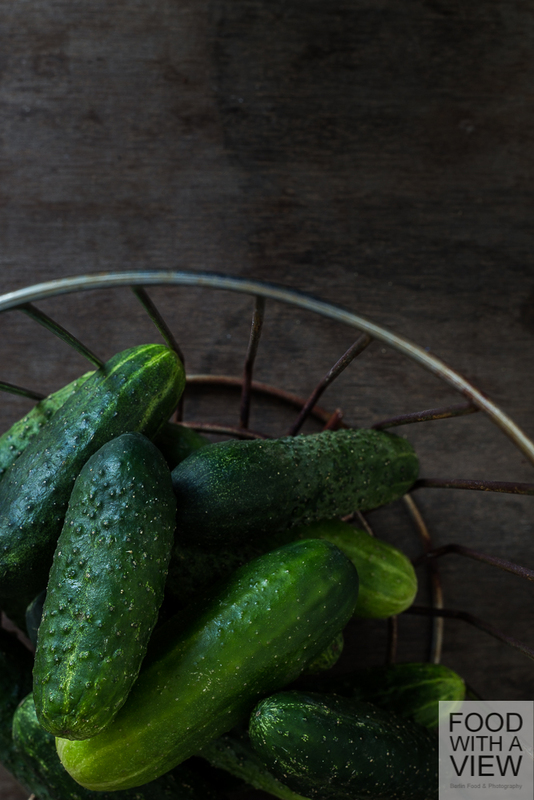 In my recipe, the cucumbers are neither crunchy, nor soft – the consistency is somewhere in between. The inner part get’s a bit softer then the outer part. 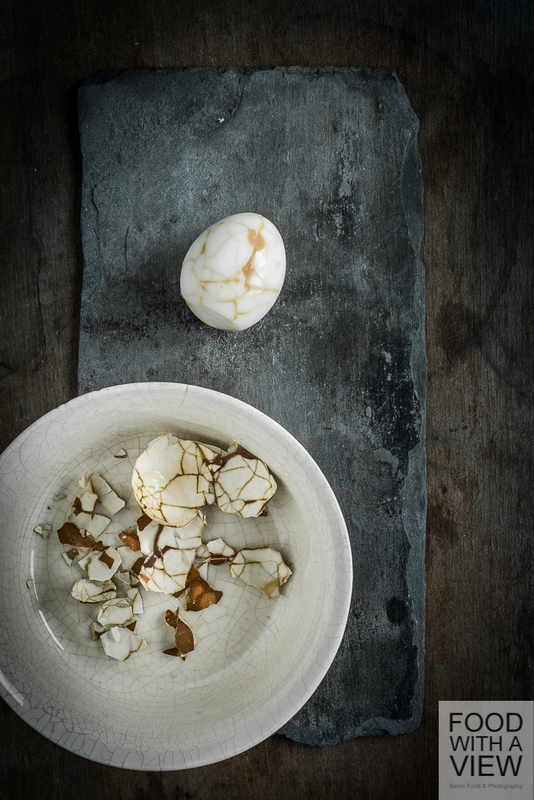 To describe the egg’s taste is not that easy- rich and very slightly acid, a bit salty of course (but just on the outside, that’s why a little salt is needed for consumption nevertheless) and orientally tasty. Especially ginger and cinnamon taste through. The best result is from day three on, it get’s more and more intense each day. Soleier! Stehen seit ewigen Zeiten auf meiner Liste. Ich muss endlich mal ran. Na, dann mal ran die Eier, das lohnt sich :-). Den “Hungerturm” kannte ich noch gar nicht, herrliche Geschichte!!! Nicht wahr, liebe Eva, die Hungerturm-Geschichte ist lustig :-). Es war auch mein erstes Gurken-Einweck-Erlebnis, und seitdem esse ich sie gern – die gekauften sind mit oft viel zu sauer. Viel Vergnügen damit und mit dem Schmalz – die schmecken auch ohne Soleier prima, und da in meinem Umfeld die meisten Menschen hartgekochte Eier grauslich finden, kann ich Deine Abneigung gegen festes Eigelb (und bei eingelegten Eiern wird das so richtig fest mit der Zeit) gut nachvollziehen :-). Ganz lieben Gruß zurück! Thanks so much, Laura! Indeed, Berlin is a very multicultural city. 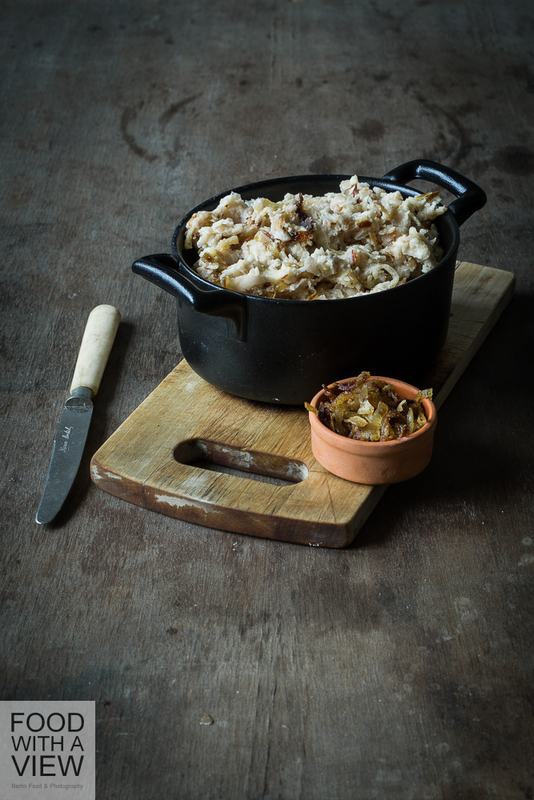 Sauerkraut is a staple at supermarkets, indeed (and also at organic shops), but regarding restaurants, it’s mainly found at traditional inns (even though it is rediscovered by modern cuisine since a while already but in totally other combinations, like fillings for crêpes etc.). 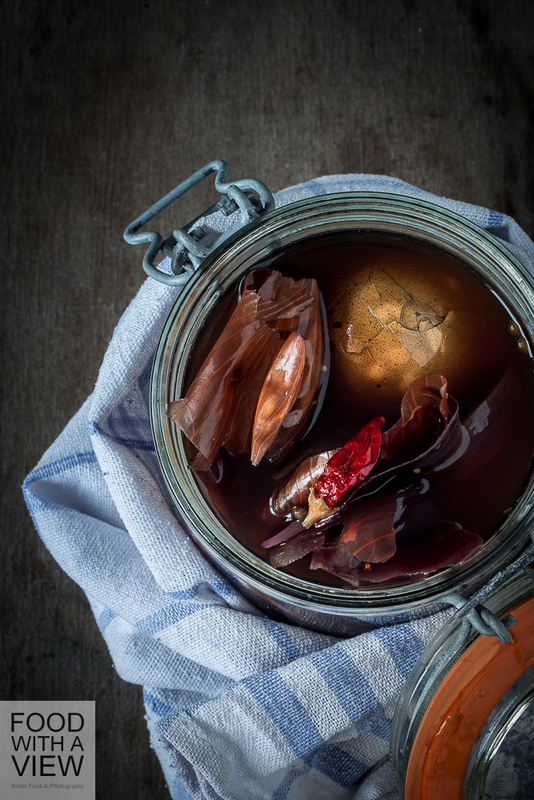 It’s the same lactic acid fermentation principle like in kimchi which might be more common to you. Hope so much you will enjoy Berlin! More on this via email :-). Your recipes are great variations on old-fashioned recipes. Your addition of spices is brilliant. Thanks. Such a lovely post, Claudia. Thank you for visiting and for the lovely compliment, Dani. Much appreciated! Wow! his brings back many memories for me! Thanks for sharing. Thanks for your comment! I’m happy that the post brings back memories to you. Beautiful images……..such a lot of work obviously went into this blog……thankyou. Thanks a lot, Tamika! Great that you like it. Awesome, I’ll try to do these this weekend. I love pickled cucumbers. Thanks a lot! Great that you want to try the recipe, I hope you will like it. I’m vegetarian, the bean spread looks delicious! Thank you! The spread is indeed perfect for vegetarians and vegans. U just bring so much of the culture and history to the palette…lovely article… I am following you for more. From the heart of Berlin ! Reblogged this on K3 Planungsgesellschaft mbH + Co. KG. Thank you! And great that you like Berlin :-). Hope you will like the recipes when you try them. Please let me know if you write for other magazines. Some of these recipes really look interesting.